​The species is distributed in Eastern Europe, Caucasus, and Asia Minor. Armenia is inhabited by subspecies K.s. sephirus, which occupies calcareous grasslands at the elevation range from 1200 to 2300 m a.s.l. The species is definitely recorded in Northern and Central regions of the country, however its penetration to the South is under question, as by preliminary hypothesis there is some splitting of the range with vicariant species K. zephyrinus. In Armenia the species is recorded to be using Astragalus pseudoutriger as a host-plant, however, does it use other Astragus species or not is a subject of further investigations. It gives one generation per year, and the butterflies are on wing from mid May till mid July depending on elevation. The species is slightly uncommon to rare within typical habitat and shows stable population trend in 2003-2013 (p>0.05). Supposedly it should be influenced by overgrazing, and it is possible that the longer-term population trend can demonstrate some decline. The species is not included in the Global and National Red Lists, as well as in CITES and Bern Conventions, but was evaluated for European Red Book as Least Concern. 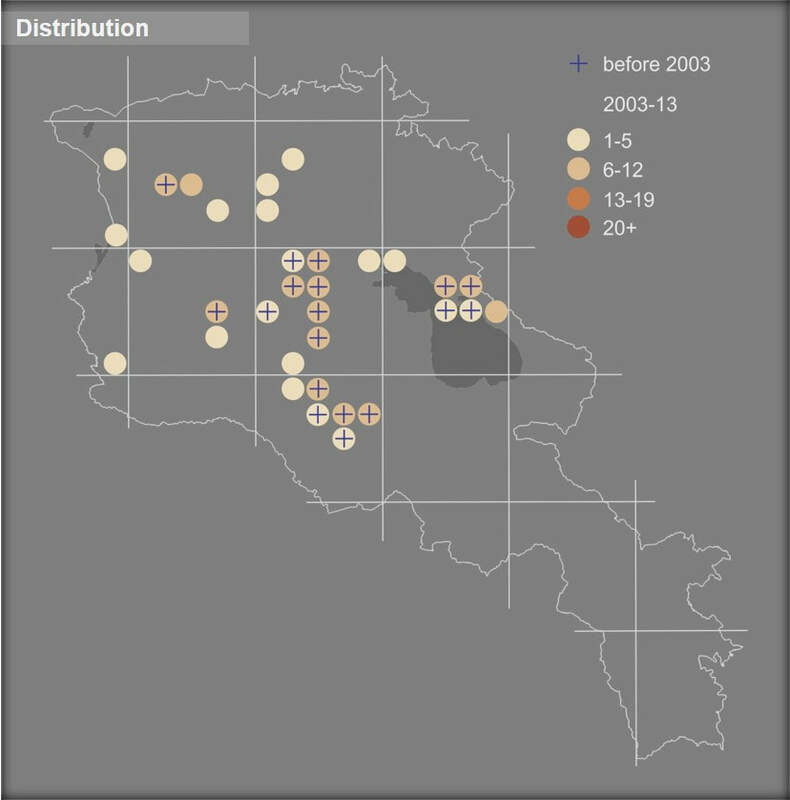 Although it is a habitat specialist, the preliminary assessment suggests the same status for Armenia, however it is important to continue tracking its population trend for early warning of possible decrease. The species' distribution range is covered by Khosrov Forest State Reserve and Lake Sevan National Park, as well as by Prime Butterfly Areas Ourtsadzor, Geghadir, and Artanish-Shorzha, and other than its monitoring there is no urgent need for other conservation measures.